Juneberry Lane: Love is in the Air . . . A Perfectly Pretty Paper Heart Garland . . .
Love is in the Air . . . A Perfectly Pretty Paper Heart Garland . . .
Just when the post-Christmas gloom has set in and you think all you have to look forward to is the long stretch of winter and the dreary days ahead, you step into your favorite craft or home goods store and spot the vast array of red & pink hearts and cards and realize all is not lost. There is Valentine's Day! With so much promise of romantic dinners with your sweetie, fluffy pink desserts, and whimisical little cards expressing love to your nearest and dearest, who can stay grumpy for long? Not you! 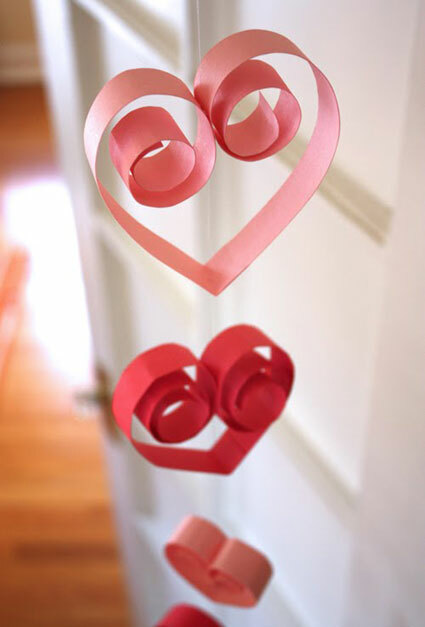 So let's kick off this season of love with the simplest and most budget friendly little paper heart garland! Sure to brighten up your holiday decoration-less home in an instant, this darling project from How About Orange is easy to make and done in a minute. Take a look . . . 1.) Cut colored paper into 3/4" strips. 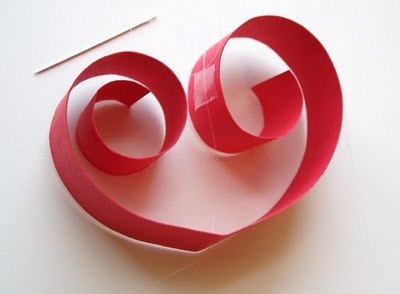 Fold them in half, or if you want some hearts that are twice as big, splice two strips of paper together at the bottom of each heart with double stick tape. Curl the loose ends around a chopstick or pen. 2.) String the heart garland together from the bottom up. I used Sulky clear thread, available at fabric stores. It's curly and hard to see so you have to fight with it a bit, but it turns out nearly invisible. Push your threaded needle up through the bottom fold of each heart, then use double stick tape to sandwich the thread between the two halves of the curled tops. Cute right? Nothing to it, right? You knew I wouldn't throw too much at you when you were still so exhausted from the holidays, didn't you? Okay, enough with the questions . . . it's great to be back and I can't wait for all of the fun we are going to have in 2012!! Happy Monday! Fun and simple make a great combination. Thanks for sharing. Juneberry Baby: The Sweetest Shower Idea . . .
'Cupid's Love Dust' and THREE FREE Printables!!! EXTRA, EXTRA! A Nifty 'Newsprint' Baby Shower! An Oh-So-Cute Cupid's Arrow Cupcake . . .
Hand-Lettered & Lovely . . . Wedding Wednesday: Beauty & the Beach . . .
Juneberry Beauty: New Year, New You! !